Spring equinox is a time of new beginning and initiating enterprises. A time of reaching balance between Dark & Light.. day & night. It is a time of noticeable lengthening of daylight hours and quickening. Flowers blooming, trees sprouting buds and leaves. Astrologically, the Sun enters the firey sign of Aries. We work actively to balance the opposing forces in our lives, and a bit of personal `spring-cleaning’ internally, then explore the mystery of Spring, through the God-Goddess cycle. Mating and fertility rites are obviously being played out by all wildlife in nature at this moment. Here are some suggestions-- Home made bread/cakes; salad; wine/ mead; soft drinks; vegan food; water; vegetarian food. You only need bring a small amount that can be added to our feasting and shared with all. 1. 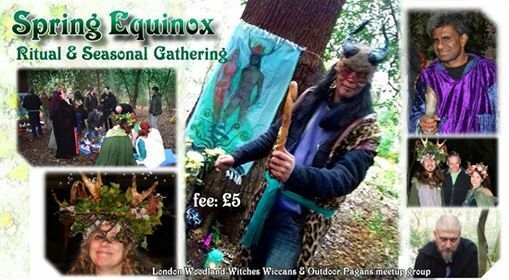 Please arrive with all other attendees as we will have a specific pathworking once you approach the ritual spot. No photography/recording during set-up or ritual; After ritual you may take photos for personal use. No use of photos or any recordings for any journalistic / student/media projects. We can not start on time, if attendees keep coming late, thinking its going to start start late anyway. This very thing makes everything delayed. So please know that we will be sticking to `actual times' from here onwards! (enough of the `pagan time'). Please be at Pub meeting point at 2pm, and you'll have 30mins to warm up/ get drinks or connect. At 2.30pm we will start walking to woods. At Spring 2019, London Woodland Witches celebrates 5 years ceremonies, socials and creation of our own community. And it is time to grow, evolve, and make some changes. 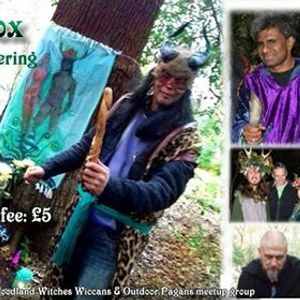 One key aspect of this is to make our Spring/ summer events more family-friendly, to include parents who can bring children (or they all stay at home and miss pagan events and connection to reest of community. We are keen to ensure we don't just focus on fertility & romance but also the result of it- children & family! Another key aspect is to include the attendees (all of you!) more in the actual ceremony, rather than leave you as spectators who interact only briefly in ceremony. This means less of Ritual team standing in front and doing everything, and more of ritual team encouraging attendees to do many aspects of the ceremony. We'll get more organic and interactive! We also like to encourage more communal & social time at our gatherings, in the woods, rather than run to the pub soon after (A bottle of wine costs £22 at pub. but can be bought for £5 at local supermarket)! Please bring wine & food, a rug to sit on, and stay afterwards and connect with one another. Lunch & Learn: Harness the Power of Mentoring PART 3 - Be That Mentor!